When I met her last year for a story on the garden, she mentioned the Pittsburgh Garden Trail, an initiative which includes seven unique gardens in the region. As Nichols and I talked about the new venture, I thought it would be fun to try and see all seven in one day and create a video of the experience to chronicle the journey. When stopping during the daylong tour of the gardens, Nichols had been preparing beds for planting. She’s hopeful being part of the garden trail will entice more visitors who can experience this beautiful and educational landscape. Ron Baraff stands in the shadow of a former working steel mill while in the Iron Garden at the Carrie Furnaces National Historic Landmark site in Rankin. It is one of the more unique gardens on the trail with wild plants and trees growing on this industrial site. Sitting on a large stone next to a sculpture with an old mill behind him, the sounds of song birds fill the air as they fly from tree to tree. 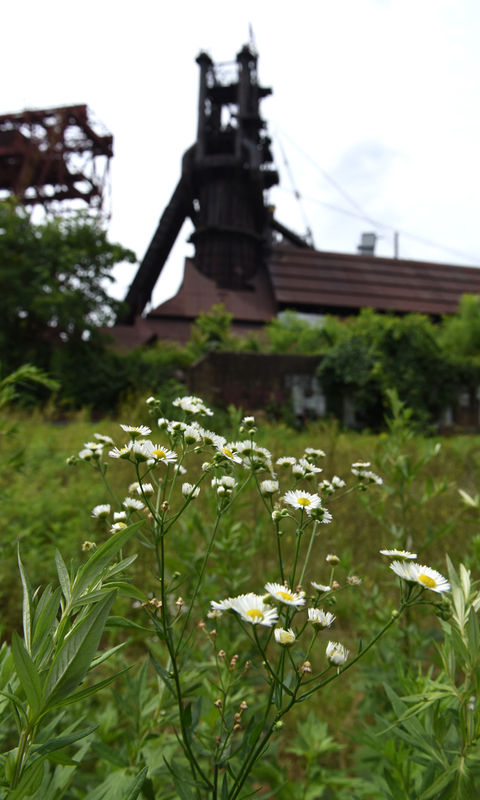 The Iron Garden at the Carrie Furnaces National Historic Landmark site in Rankin is one of the stops on the Pittsburgh Garden Trail. One surprise for people might be The Frick Pittsburgh Museums and Gardens. It includes six acres of beautiful plantings and trails. Every shelf in the Victorian style greenhouse is filled with interesting plants in a rainbow of colors. The trails are lined with fragrant lilacs, roses, classic garden benches and perennials. Many of the plants will soon be paired with the art in the museums. There’s even a new mobile app to help visitors experience the grounds available for free at the iTunes or Android stores. Chatham University’s Arboretum might be another hidden garden treasure for some gardeners. Native redbud trees put on a show along with ground-hugging purple epimediums and spring bulbs. Kristen Spirl and her team care for 60 historic acres. She wants visitors to enjoy the gardens and get ideas, too. The Pittsburgh Zoo and PPG Aquarium uses plants to help create the proper environment for animals and also for the pleasure of those who come to see the exhibits. 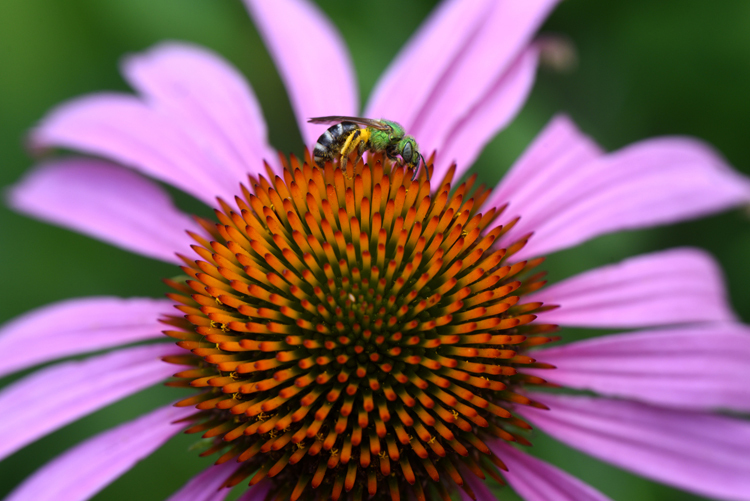 A native bee visits a coneflower at the Pittsburgh Zoo and PPG Aquarium. This is in a garden outside the education center. The zoo is one of the stops on the Pittsburgh Garden Trail. There are also plantings all over the zoo of perennials, shrubs, trees, spring bulbs and annuals to please the visitors. There’s an important meaning though for all the plantings here. Phipps Conservatory and Botanical Gardens is probably best know for its seasonal flower shows, but there’s a lot more going on there, including the exhibits in the Tropical Forest that change every three years to highlight a different eco-region of the world. “We are the only botanic garden in the country that features these large rotating exhibits,” Jordyn Melino says. The current show highlights Cuba, where she visited for weeks to research the flora and fauna of the country. Another thing people might not know is that Phipps has a deep commitment to sustainability — the Center For Sustainable Landscapes building is actually zero net energy and water. Our last stop was the Pittsburgh Botanic Garden to talk to executive director Keith S. Kaiser, who is also the coordinator for the Pittsburgh Garden Trail. 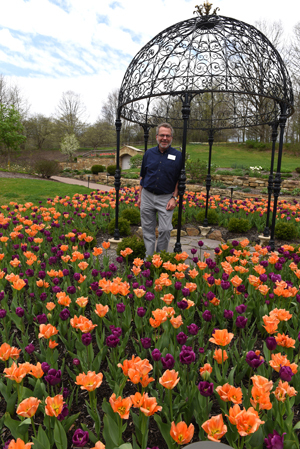 Standing next to thousands of blooming tulips, he explains one of the important aspects of the Pittsburgh Garden Trail. Pittsburgh will recognize Pittsburgh Garden Trail Day on Friday May 11, as proclaimed by Pittsburgh Mayor Bill. All seven gardens have something special planned to celebrate. Carrie Furnaces (A Rivers of Steel site) — free previews of the new Post-Industrial: the Arts & Grounds tour offered from 2 to 8 p.m.
Chatham University Arboretum — free tour of the Arboretum offered from noon to 2 p.m. Please RSVP to arboretum@chatham.edu as space is limited. The Frick Pittsburgh — Visitors are welcome to explore six acres of lush grounds, gardens and a working greenhouse, making the most of their visit with the new landscape app, which is available for free on the iTunes and Google Play stores. Phipps Conservatory and Botanical Gardens — 50 percent off admission to “Summer Flower Show: Gardens of Sound and Motion” and May Market event open to the public 9:30 a.m. to 7 p.m.
Pittsburgh Botanic Garden — Buy one admission get one free (or one free guest admission for members) and showcase of the Margaret Lawrence Simon Dogwood Meadow, including hands-on activities from 10 a.m. to 2 p.m.
Pittsburgh Zoo & PPG Aquarium — Join the zoo’s polar bear mascot for a photo opportunity and participate in giveaways from 10 a.m. to 1 p.m.
All gardens are open for self-guided tours, encouraging guests to visit and explore each one. To further engage in the celebration, guests are encouraged to take a photo at each garden they visit and share it on social media using the hashtag #PGTDay on May 11.